I brainstormed several ideas for a unique celebration in the months leading up to my 26th birthday. The bars have never been my scene, a sit down dinner seemed so passé, and I wanted to spend a few days away from the city before autumn weather rolled in. Big Sur was high on my California hit list, and I found a great campground called Kirk Creek that offers a private beach along with campsites that sit on a bluff overlooking the ocean. The masochist in me couldn’t resist the urge to search for nearby races, and sure enough, Envirosports was hosting the Big Sur Trail Marathon the same weekend I was looking to camp. 26 miles for my 26th birthday: sold! A few hours of light sleep on the ground and a large bowl of Rice Krispies later, I found myself toeing the non-existent start line at my first trail marathon. The course has substantial gain – roughly 5700′, 1000′ of which comes in the first three miles. Much to my surprise, I managed to keep pace with the chase pack all the way up the first climb until we were met with a rather unusual obstacle: a cattle crossing. At least 100 cows crossed the fire trail, and the entire race screeched to a halt while they passed. Well – most of them passed. As soon as I broke into my running stride, it was obvious that something wasn’t right: there was a straggler waiting on the opposite side of the trail, eyes fixed on my every move. Without warning, the mad cow dropped its head and charged at me full speed. I had no choice but to jump off of the trail and drop at least five feet into a pricker bush below, praying that the bull (cow sounds too innocuous for this story) wouldn’t follow suit and proceed to crush me. Fortunately it didn’t, but I did manage to get bloodied up and lose the chase pack, not to mention a water bottle from my embarrassing water belt in the process. 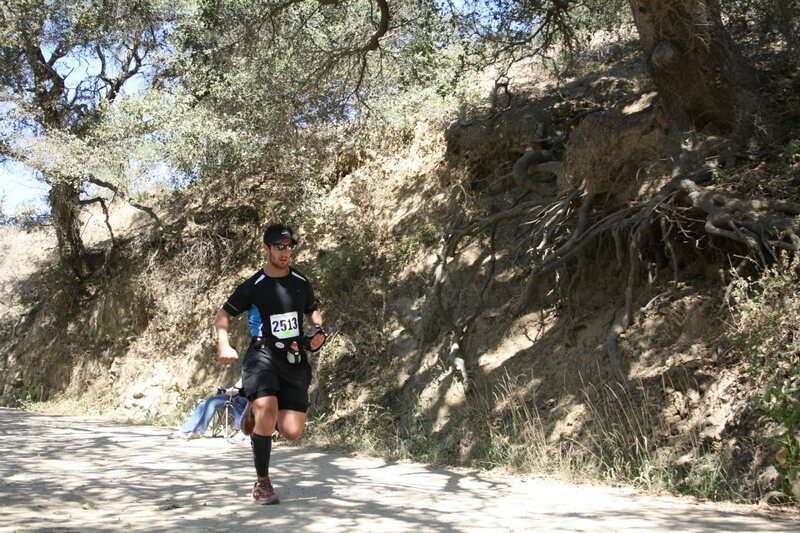 Taking third in my age group at the Big Sur Trail Marathon. Can you spy the missing water bottle? After climbing back up to the trail to stunned onlookers, I dusted myself off and got back to work. My heart rate skyrocketed between the adrenaline and the elevation gain. I stopped to talk to the race director not far past the turnaround, and word of my close encounter had traveled fast. Although I missed my target finish time and kept my friends waiting, I did manage to make a late push and place third in my age group. My explanation of why I missed my target by over a half hour was met with a mixture of laughter and eye rolling from my friends. Moments later, I was vindicated when fellow finishers came over to check on the guy who was run off the trail by a bull, only to fall into a pricker bush, and then proceeded to dust himself off and run twenty three more miles through the mountains. This memory captures the essence of why I run on the trail: not because I like to make leaps of faith into thorns to avoid disgruntled ungulates, but because I never know what’s around the next bend. Taylor and I can rattle off the miles down to the tenth when we run along the Embarcadero or Chrissy Field, but trails offer an element of surprise that counters the desensitization of running a limited set of routes on the road. It’s Friday: you have the whole weekend ahead of you. Get out and explore a new trail or route. Most importantly, if and when you do get chased by livestock, remember that the cow was actually a bull, and you wouldn’t believe the size of its horns. Oh my gosh I can’t believe a cow charged at you…what a story! Even though I haven’t run an official trial race yet, I absolutely love training on trails. Distance seems so much less important to me than when I’m running on the road. Would you believe me if I told you that a seal swam into me when I was swimming in the Bay? Taylor and I feel the same way – there’s something to be said about leaving the Garmin at home and running for pure enjoyment. I would highly recommend the Bear Valley Trail in Point Reyes if you’re looking for scenic, gentle trail amidst the steep climbs of Marin.